Collegiate High is a partnership between the Hamilton County Department of Education and Chattanooga State. Collegiate High serves as a launching pad for students in grades 9-12 to be "ahead of the game" and expedite their education. Collegiate High offers students the opportunity to earn a high school diploma and an associate's degree. Even if students haven't earned an associate's degree by high school graduation, students have earned college credit hours toward a college major of their choice. The Collegiate High supports student achievement by providing students with the knowledge and skills necessary for postsecondary success. Nationally, Collegiate High students are some of the most sought-after students. Our graduates continue their education in colleges and universities across the nation. Ninety percent of Collegiate High graduates transfer to a four-year college or university. Additionally, our ACT composite continues to rank above the state and national average. 10th - 12th grade students must have an ACT composite score of 19 or higher (see ACT test information below). 9th grade students must have an ACT score or take the ChattState Accuplacer. Students must be entering their freshmen, sophomore, junior, or senior year in high school. 10th - 12th grade students must be on track for graduation. Present recommendations from two teachers and/or school counselor, or a school principal. Home school students can have the option of having their recommendation from other community sources. Recommendation can be mailed or faxed to the Collegiate High Office. For grades 10-12, submit a recent ACT or SAT score (within the last three years). If you have not taken the ACT, you are encouraged to register to take the test on one of the national test dates. Registration forms and information may be obtained from your guidance office. The Residual ACT test is administered in the Testing Center at Chattanooga State every Tuesday at 9am. To obtain a Residual ACT test permit or Accuplacer test permit, please call the Collegiate High office. 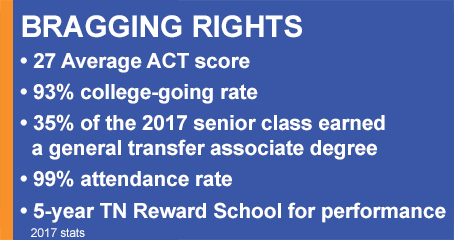 An ACT composite score of 19 or better is required for admission to the Chattanooga State Collegiate High program for students grades10-12. Attend High School at Chattanooga State! Students at Collegiate High have full access to the Chattanooga State campus, including clubs, organizations, intramural sports, and student government. Also, students have an opportunity to participate in the UTC marching band program, Chattanooga State Symphonic Band, and Concert Choir.